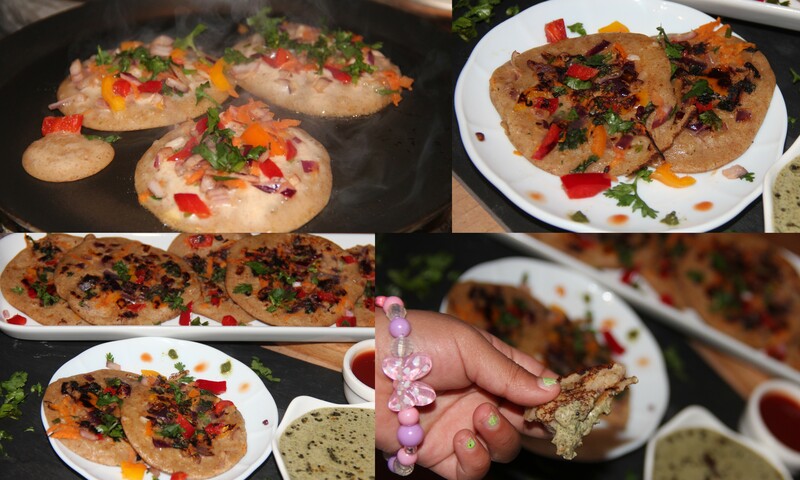 Uttapam is essentially a fermented rice and lentil pancake made tasty by incorporating veggies. 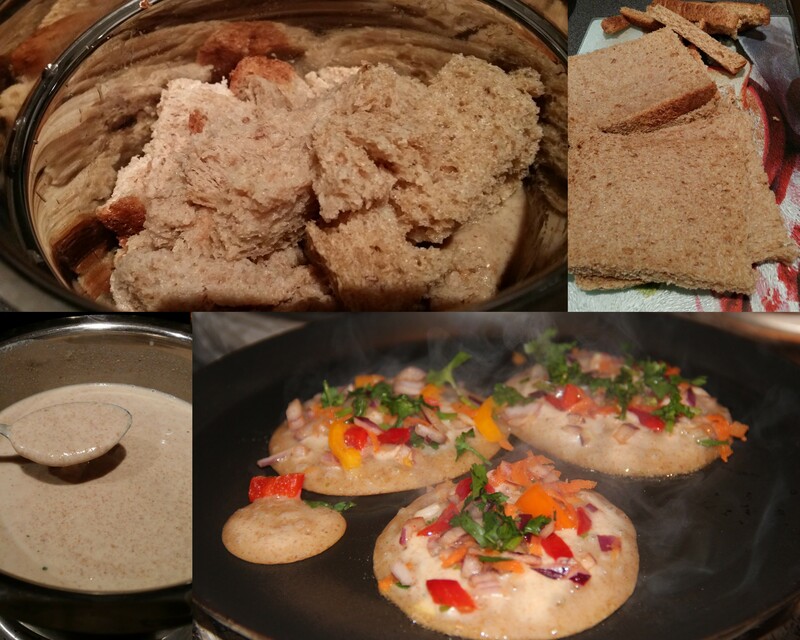 In this recipe Instead of fermented dosa batter I used bread which can be used instantly without any fermentation. This is a very simple recipe. Beat the pancake/uttapam batter then let the batter rest while you chop up the veggies. These are served with a sauce/dips and kids friends too. Take out the bread crusts and break it into small pieces. In a mixing bowl combine onion, bell peppers, carrot, tomato, chat masala, chilli powder, coriander mix well and set aside. Adjust the batter consistency by adding water if it’s too thick, add salt mix well. Heat a non-stick pan/tawa on medium heat- grease with some oil and pour a ladle full of batter and spread lightly to a pancake consistency, sprinkle some chopped veggies, drizzle some oil over the edges, cover it with a lid and cook over a medium flame for 2-3 minutes. Flip and let it cook on the other side until cooked. Repeat the same with rest of the batter and veggies. 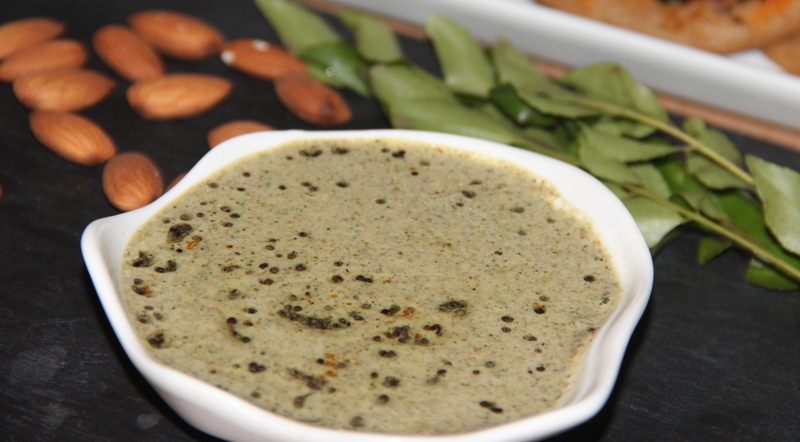 Serve hot with a unique flavoured Almond curry leaves Chutney. For topping the combination of veggies can be personalised as per the taste. Can substitute whole wheat bread to white bread if desired. Posted on February 20, 2015, in Breakfast, Indian, Kids recipes, Main dish. Bookmark the permalink. 13 Comments. Always wanted to try this…Looks fabulous Chitra!!! These look delicious. I would love to make them with fermented batter too. Do you have the recipe for that? Thank you. Wow! I can’t wait to try some of these! They all look so good. I hope I have all the ingredients right now. If not, I’ll go get them. Thanks again. So nice to hear that….Await to hear from you..